Yesterday your letter from January 14th arrived. Thank you very much. I was very happy because it was the first news from home. I want to answer back straight away. The heavy frost lasted only a few days, and I hope it was the same over there? Most of the time the weather here is the same as in Germany. Nowadays the temperature is not lower than minus fifteen degrees, and it is more or less bearable. Inside my room it's rather cold, minus thirteen most of the time, but I am more or less used to it now. Well what else can I do? When you write about the wonderful hours that I spent with you I can only confirm that it is my wish to spend many such days with you, and I hope soon. I don't regret a single day that we spent together. A better holiday I couldn't have wished for. Thanks for the greetings of your colleagues; give them my regards, I think back with pleasure of the rabbit dish, especially when we were having it for lunch with the sauerkraut soup. Right now I haven't any stamps for parcels. As soon as I have any I will send them over. I am already looking forward to the birthday cake. Please send it. The Christmas cake survived the trip beautifully and tasted delicious. By the way. I ate the last bites of sausage yesterday. Now, everything is gone - a pity, I couldn't parcel things out any better than I have. Food rationings are now becoming a little difficult, and I will have to see how best I can manage. I think it's too risky to send the camera. Whenever someone goes on leave again, I'll write to you. That's safer. Perhaps I'll get leave myself sometime now and I'll be able to bring it. The main thing is, that you at least get it at all. Money is no object. Next opportunity I get, I'll send you 100 Reichsmark. Any hope of a training course or getting sent home are in vain. You know I have to be content that it is still relatively safe where I am right now. Four million men, one major offensive and it seems likely to me it will be over. By the way, I was surprised that many of my comrades feel the way I do. People are seeing things the way they really are. Oh well, I hope everything turns out for me best one way or another. That was all about the letter. 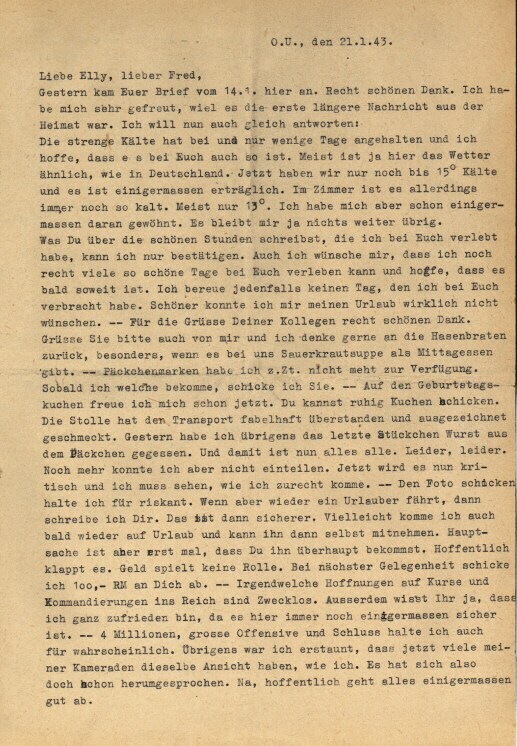 - In the meantime, I received a letter from father as well - the usual nonsense, fights with Uncle Alex, which are not just stupid but also thankless, as is fighting with the whole world, war mania etc. etc. It won't be long and I don't care to respond to this stupidity. It is always the same and one letter is just like the one before. I got a letter from Egon as well. It was sent on December 23rd. He is in Stalingrad, provisioned by air only, seven men, one loaf of bread, only cold food, lots of work, fighting all the time. It is said to be horrible. Once they were trapped there for 4 and a half weeks. For the rest not much news. I have guard duty a lot. Apart from that I have nothing else to do. Today lots of snow and rather warm, minus five at most. It seems that the winter is merciful to us. I will send money soon. The report on the town is finished fast because I promised it to you. It had to be done in a hurry and therefore it's nothing special. I'll write more about it when I can. Well that was just about everything that I had to say. Hope to hear from you soon, especially about the air raids. Hopefully it won't start again like it was two years ago. Tomorrow I go to the dentist and the day after I have guard duty. So for the next two days I will be busy. When nothing special happens, I will write you again in eight to ten days.